From helping us find the right property for my family, to booking the property Maggie and Toni made us feel a welcome part of Cayucos. Cayucos is a special town, best enjoyed when you understand its pace and style. Two days prior to our arriva, Maggie called to make sure we knew how to locate their office and sent an email with great instructions and an overview of the area. When we arrived, everything was ready for us. Checkout was a breeze. Hugs and good wishes, we hated to have to leave! 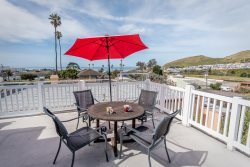 We adore Cayucos and would gladly recommend it to anyone considering a relaxing family vacation. There is just enough to do, and not too much that would distract one from the beach, surroundings and glory of this Central Coast gem. We only wish we had booked it longer. We can't wait to come back. Beachside Rentals were friendly and efficient. Problems with the heating system were quickly resolved. I would happily recommend them. We stayed for two months to escape the British winter and our family joined us for Christmas and New Year. Everyone enjoyed their stay. The local area has superb wildlife and landscapes. Cayucos is a very friendly small town, the ocean is wonderful and the wine and beer are good as well! Lovely little place to stay. A lot of thought went into the landscaping too.